Hi, everyone! 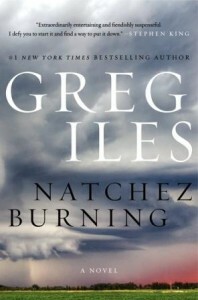 Today I'm a stop on the TLC blog tour for Greg Iles's Natchez Burning. Mayor Penn Gage has always looked up to his father, but when Dr. Tom Gage is accused of murder Penn is forced to reevaluate everything he thought he knew about the man. Viola Turner was a nurse who worked alongside Tom during the Civil Rights era. In fact, Viola's own brother was a well-known musician and activist whose disappearance has never been solved. Viola left for Chicago where she lived until just recently. Sick and with the knowledge that she didn't have much time left, she returned to Natchez and sought care from Tom. Though her time was limited, her death is attributed to an overdose of morphine and Viola's son is convinced that Tom is behind it. Assisted suicide is a prosecutable crime in the state of Mississippi and unfortunately for the doctor the line between that and murder is a fine one. At the same time, a reporter from just over the river has made his career exposing the crimes of the Double Eagles - a violent offshoot of the KKK. Viola had been recently interviewed by the man who now has cause to suspect that the Double Eagles themselves could be responsible for her death. As the mystery becomes more convoluted, crimes of the past begin to surface and certain individuals are definitely willing to do whatever it takes to ensure their names are kept out of the spotlight. Natchez Burning is actually the fourth book to feature Penn Gage - author, lawyer, and now Mayor of Natchez. Interestingly, it's also the first of a trilogy that continues in The Bone Tree and next year's Mississippi Blood. The story traces back to the 1960s, and indeed begins there with multiple murders and the formation of the Double Eagles. And the scene is set for this dark and twisty doorstopper of a thriller! In spite of it's heft (roughly 800 pages), Natchez Burning moves at a swift pace. Part of this is spurred by the fact that many of the players are still actively involved in the plotting that began all those decades ago. The book is set in 2005 and, as Penn and reporter Henry Sexton discover, the original Double Eagles are still very vested in keeping their crimes under wraps. Sexton, inspired by (according to the author's afterword) the very real pursuits of Stanley Nelson, is determined to not only bring the Double Eagles' crimes to light but to unmask those who have so far been able to hide behind not only power and money, but the public's ignorance of the very crimes they are responsible for. The murders kept quiet for generations, the disappearances that have yet to be uncovered, and the other crimes that were swept under the rug so many years ago. Of course his efforts have not gone unnoticed - the FBI consults with him in their own attempts to solve these cold cases and the perpetrators themselves are very aware of how close his stories have come to revealing their secrets. Penn, however, is mostly unaware of his father's own involvement. Tom Gage held a precarious position in the 60s and has vowed to keep Viola's secrets. Claiming doctor patient confidentiality, he is unwilling to budge and offer any help to Penn in his own defense. It's hard to say much more about the plot as there are still two chapters to the trilogy to consider and I don't want to spoil anything for those just coming to the books! Natchez Burning is a fine example of exactly why so many folks are fans of Iles's books. And while I'm not completely new to the author, I've never delved deeply into his work before now. I am, though, completely invested in this story and in seeing how it will continue to play out. And now for the giveaway! I've got one copy of Natchez Burning and a super cool tote bag to give away today. To enter, simply fill out the Rafflecopter below before Monday, September 5. Open US only please. For more on Greg Iles and his work you can visit his website here. You can also like him on Facebook and follow him on Twitter. I've heard good things about this author. I would love to start reading his books with this one! Thank you for the chance! I have read many books by this author and they are excellent. Thanks for this great giveaway. I haven't read this author's books before, but wow, I love that they are page-turners. Thanks for the review and info about the rest of the series.